On June 30, 1914 the Art Gallery of Hamilton held its inaugural exhibition, thirty-three paintings by Hamilton-born artist, William Blair Bruce (1859 – 1906). June 2014 marks the 100th Anniversary of the gallery, and the opening of the largest retrospective of Bruce’s work. Since 1972, the Brucebo Fine Art Scholarship Foundation has offered a residency to a Canadian artist. The scholarship was established to honour the memory of two artists, Caroline Benedicks-Bruce of Sweden, and William Blair Bruce of Canada. In 2010, artist Kristin Bjornerud was awarded a Brucebo Residency in Sweden. 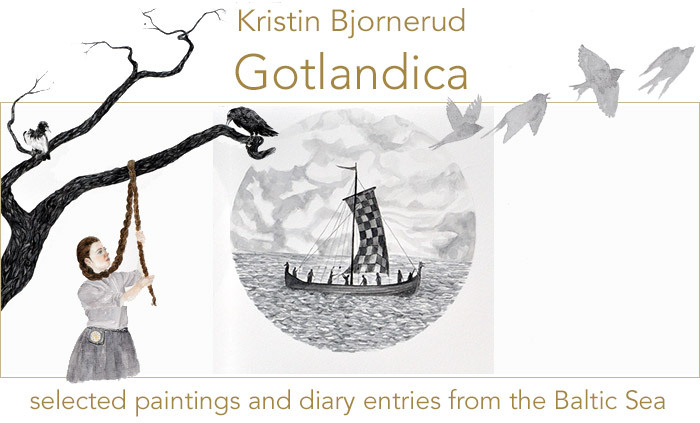 What follows is a selection of diary entries and paintings produced during her stay at the Bruce cottage, located on the island of Gotland in the Baltic Sea. Work from this series was featured in a solo exhibition at the Art Gallery of Hamilton in 2012.